So, you’re into steampunk now. You know the background, you’ve read some H.G. Wells, and you’ve made some pretty cool steampunk gadgets. Now, all you need to do is work on your steampunk fashion. There are a number of websites out there to help you learn all about creating the perfect steampunk outfit, but sometimes seeing the outfits in action help you more and even inspire you to invent your own styles. Here’s a short list of great movies that inject fantastical steampunk elements and fashion into their stories. Take a look! Sherlock Holmes (2009) – You may be familiar with the famous Detective Holmes and his partner Watson, but you’ve never seen a steampunk mystery adventure quite like this. 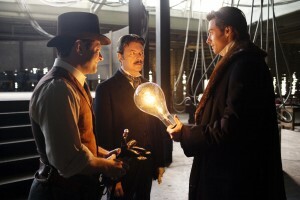 The Prestige (2006) – This thrilling tale of two dueling magicians infuses steampunk elements into its mysterious and twisty plot. The League of Extraordinary Gentlemen (2003) – In a textbook example of steampunk aesthetic, this adventure film features an alternate Victorian world where famous science fiction and adventure characters band together. Wild Wild West (1999) – Will Smith and Kevin Kline team up in this alternate 19th-century comedy western. The Adventures of Baron Munchausen (1988) – An early example of the steampunk movement showing up in film, this fantastic tale of an 18th century aristocrat features alternate histories, interesting mechanical inventions, early steampunk fashion, and great performances from Eric Idle, Sarah Polley, and Jonathan Pryce.